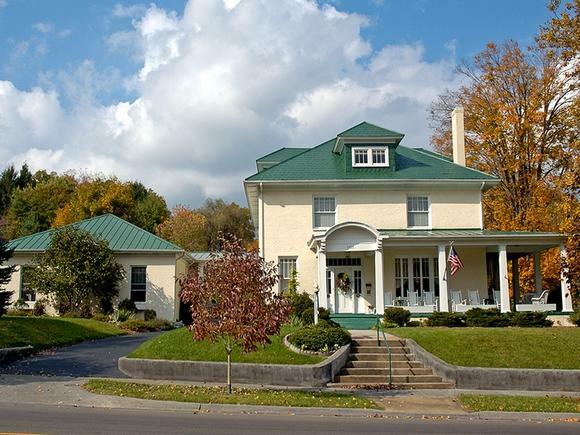 Summerfield Inn is a large 1920’s era Colonial Revival home, offering our guests a truly unique B&B experience. Seven guestrooms, three are ground level, give you space to relax and unwind. All have in-room baths, five with whirlpools. We serve a full gourmet breakfast. Our large parlors with gas fireplaces and sitting areas provide ample space for both small and large groups. A guest pantry is available for morning coffee, complimentary snacks, beverages and includes a refrigerator and sink. An old fashioned wraparound porch with rocking chairs and swing is a wonderful place for morning coffee, a midday break or evening relaxation. Enjoy a walk along the stone pathway with English style rose and perennial garden.